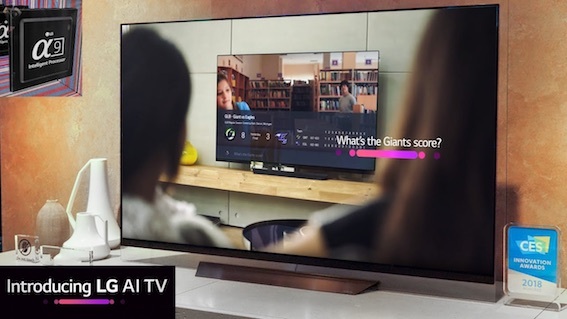 PAT PILCHER heads to LG’s new TV lineup showcase in Sydney, where TVs were not only looking better than ever, but getting a whole lot smarter too. It’s that time of the year again with TV manufacturers showcasing their latest and greatest. First cab off the rank for 2018 is LG, who showcased their TV lineup in Sydney. As expected their already popular OLED lineup got tweaked and tuned. They’ve also announced affordable LCD models that offer peeper-pleasing video. LG’s focus has changed this time around. Usually, the killer features touted involve incremental tweaks to picture performance. Sure, there’s been huge improvements to on-screen images, but the big news is voice recognition and AI. LG has bundled their take on Alexa and Siri, calling it ThinQ. 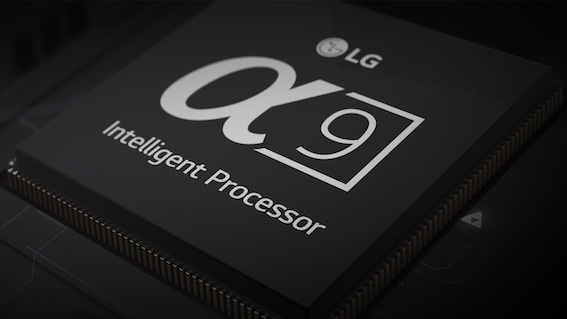 According to LG, AI smarts will soon get embedded in all LG TVs. An integrated voice assistant means your voice becomes the remote – and learning a new remote, on-screen user interface becomes a non-issue. It works when the user picks up the remote, hits the white button with a mic symbol on it and speaks one of 30 commands. These cover common chores such as changing channels, adjusting the volume and so on. It all feels very magic-like, and ever so convenient, too. ThinQ also has integrated natural language processing. This means that beyond barking one of the 30 commands at your TV, it’ll also apply smarts to anything you say. It is smart enough to work out that when you say, “will I need an umbrella”, you want weather information. If that wasn’t enough, Google’s Assistant is also planned as part of a future update. With this, you’ll be able to utter “OK Google” and get information on shows along with other Google assistant capabilities. While there’s little doubt that moving to voice activation and adding a dash of AI could be a game changer, caveats apply. For a start, ThinQ smarts are not yet available. That said, buyers will be able to use the 30 voice activated commands built into the TV. There’s also no firm date for when Google Assistant capabilities will get added. With Google treating New Zealand as the poor cousin – outside of a router and Android phones, little Google gear is available in NZ – there’s no real way to know when it’ll arrive. Last but by no means least, the cloud-based services powering ThinQ will be in Australia. Here’s hoping there’ll be support for New Zealand English, otherwise accessing channel six or shows with fish and chips could get tricky. Voice and AI stuff aside, LG’s OLED lineup comes in screen sizes ranging from 55” to 77”. There are a range of different designs, from the Picture-On-Wall W series, Picture-On-Glass, One Glass Screen and Cinema Screen. Except for the B8 model, the entire range comes with a new video processor, the Alpha 9 which does some amazing things with video footage. 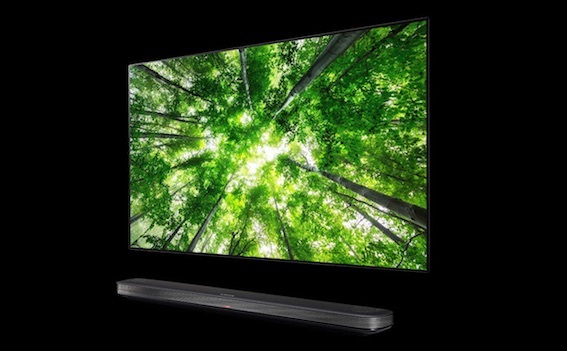 The Alpha 9 handles chores such as reducing video noise and processing on screen images so that the already impressive output of LGs OLED panels seems to almost leap off the screen. The Alpha 9 image processor has another nifty trick up its silicon sleeve: It supports high frame rate (HFR) video, up to 120FPS. As tempting as it may be to think ‘big fat hairy deal’, consider this: At a 120 FPS, the Alpha 9 processor manages the luminance (brightness levels) and chroma (colour levels) of a whopping eight million individual pixels at a mind blowing 120 times a second. According to Nowiknow.com, with no breaks, it’d take 11 days, 13 hours, 46 minutes, and 40 seconds to count from one to 1,000,000. Up that by a factor of eight and repeat 120 times. Fast eh! The upshot of all this is that Alpha 9-equipped TVs deliver silky smooth video and fast-moving objects look super real. Subtle nuances and super realistic colour rendering also make for stunning on-screen images. The Alpha 9’s HFR video capabilities will be a boon for sports fans. Shots involving lots of fast panning should in theory display smoothly. Audiences in the grandstand won’t look like coloured blurs. A fast-moving rugby ball won’t look like an oblong shaped blur. And it isn’t only rugby nuts who’ll benefit – gamers can rejoice too. At the LG showcase, gaming on a UDH capable Xbox One looked stunning. It wasn’t all OLED either. While there’s no debate OLED delivers eye-popping video, it comes with an eye watering sticker-price. Aware of this, LG’s boffins have ramped up their more affordable LCD offerings. This has seen them adding further refinements to the nano cell technologies already use with LG IPS LCD displays. There are nine LCD offerings. These will range from a roomy 49” through to a mahoossive 75”. At the showcase, I had to do a double take to confirm that the TV I was looking at was an LCD display. because LGs Nano Cell tech pumped out super vivid colours. Local dimming also made for big improvements in contrast levels. On-screen dark areas were as deep as the inky black of night while light areas were so bright I gotta wear shades. As you’d expect, HDR is pretty much everywhere. A tonne of different HDR formats are supported including Dolby Vision. In selected models Dolby Atmos is also baked in and makes use of reflected sound to deliver a surprisingly convincing faux surround effect. This is probably due to LG’s recent partnership with high-end audio manufacturer, Meridian. If LG’s showcase is anything to go by, TVs are not only looking better than ever, but they’re about to get a whole lot smarter too. 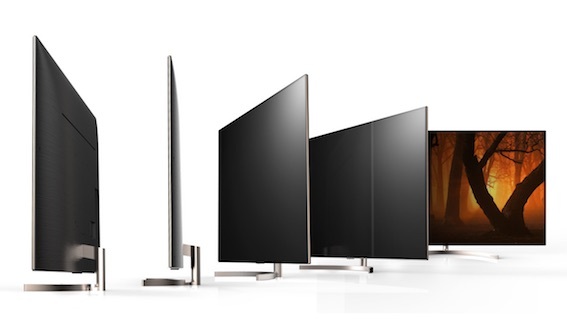 LGs new TV range will become available in mid-May.